What’s guanciale? Cured hog jowl and one of the ‘Big 8’ of cured meats (guanciale, pancetta, lonza, coppa, prosciutto, lardo, spalla, and salumi). You may think the name for this particular cut of cured pork goodness comes from ‘guanca’ the Italian word for cheek, but you’d be wrong. ‘Guanciale’ actually means pillow. No idea how it got that name but it makes sense because raw hog jowls from the butcher are fat and soft, similar to really fresh pork belly but without the skin and more fat content. One issue I’ve previously had when making guanciale is following the curing rule of waiting until the meat loses 30% of its post-cure weight. Because there is usually so much fat it never ever really reaches the level. Fat just doesn’t dry out like meat. Just look at the fat vs meat in the photo above Anyway, with this batch of guanciale I decided to run a little experiment and just let them hang and hang and hang until I needed one. Just let nature run its course and see what happens. It was a wise decision. 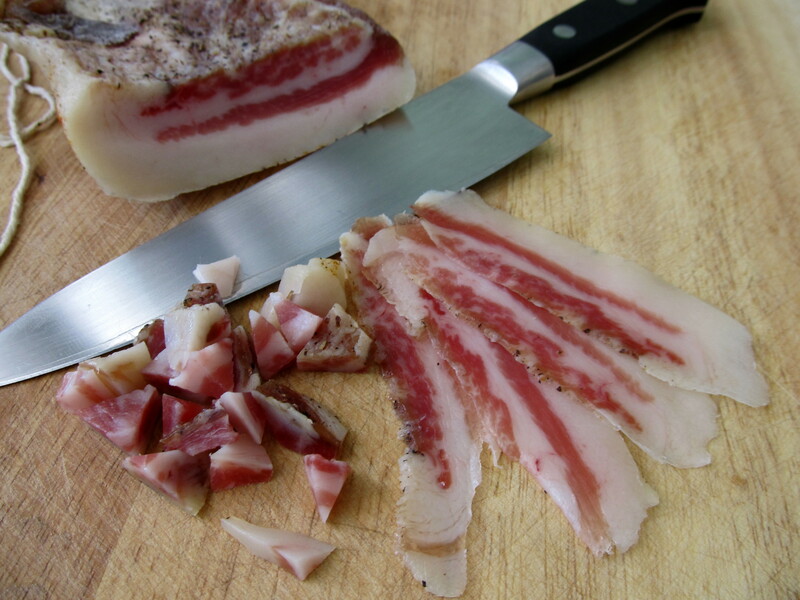 Until now I don’t think I’d ever been able to just slice and eat my guanciale like charcuterie. I just always used it in cooking. Oh what we were missing! It has an excellent sweetness to it from the sugar and the aromatics add loads of savory flavor, especially the thyme. The fat on this guanciale is also very smooth and buttery. Honestly, I think that part amazes me the most, the fat tastes so damn good and has a velvety, slippery, texture. It’s a really good feeling to have made something this delicious. The guanciale in the photo above had been in the fridge for about 7-8 weeks. It was one of the larger ones, weighing in at a little over 1 lb uncured. The extra time definitely helped but I also think ordering a larger quantity than normal from my butcher helped even more. I’ve noticed when I order 5+ lbs of anything I end up with better cuts, bigger, meatier. It worked out so well I’ve ordered another 5 lbs to cure since there are only two more guanciale hanging downstairs! This is one cured meat I really should have on a continuous cycle. Rinse off the jowl and trim away any membranes or extra stuff which doesn’t look like fat (glands). Place the jowls in Ziploc bags (1 gallon size works great) and pour the mixed cure over the pork. Flip the pieces around inside the bag making sure to get all of the surfaces covered with the cure. Place a few sprigs of thyme in the bag on top of the meaty part. Place the bag on its flat side in the fridge, so the jowls are distributed evenly in the bag. Turn the bag over and give it a rub every other day or so in order to redistribute the cure. Refrigerate for a week until the meat is no longer squishy. It should feel firm all the way through. When the meat is ready, remove from the bag and wash off the cure under running water. Rinse it well, pat dry with paper towels. Pierce a corner of the jowl, run some kitchen twine through it, tie a knot, weigh, and hang in curing fridge. Keep in curing fridge for about 5 weeks or more, until the jowl becomes firm. You can weigh it before hanging and remove when it has lost 30% of the weight but you’ll be waiting a looooooong time if the meat has a thick layer of fat. Sounds amazing! What do you use as a curing fridge?